Liz Turner is Curator of Invertebrate Zoology at the Tasmanian Museum and Art Gallery, and has closely studied giant squid. In this account of one such close encounter, she left her office for a two-day expedition with members of the Museum’s Zoology Department to Bruny Island to re-create a squid stranding for a documentary. The whole venture was an outstanding success, and the blowflies loved every minute of it. By LIZ TURNER | Between June and November 1999, the Zoology Department of the Tasmanian Museum and Art Gallery received three specimens of the giant squid, Architeuthis dux. These were placed in cold storage awaiting possible future dissection. One specimen arrived the day before the June Environmental Expo at the Tasmanian Museum and Art Gallery and was placed on public display for a day, recording the highest hourly rate of public attendance on record for the Museum. A story by the ABC’s The 7.30 Report sent our squid international and alerted the British film company UK Productions, who decided to include the squid in a documentary about giants within groups of animals. It was therefore arranged to take one of our giant squid to Cloudy Bay, Bruny Island, to simulate a stranding. The logistics of transporting a quarter of a tonne of thawing, smelly, slippery ‘blubber’ from Hobart to Cloudy Bay and into the sea were quite a challenge. Also needed was the construction of a high scaffolding tower for overhead filming. On Thursday, March 2, 2000, in plus 30°C heat, the expedition set out with three vehicles including a utility, loaded with ice kindly donated by AquaTas, and a four wheel drive with a trailer filled with squid, tarpaulins and scaffolding. 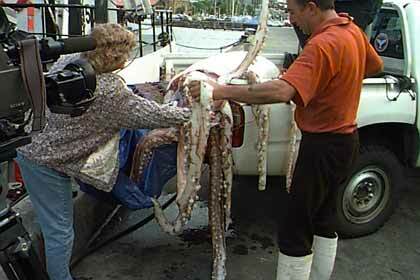 We took two squid in the end, making up half a tonne in weight. Unbeknownst to us, the first squid (245kg) had been originally frozen in two pieces before donation and these fell apart on thawing. So on the actual day we had to load up another one, still frozen and weighing 255kg, to be pliable by the same afternoon! Fortunately the very hot day helped considerably, causing the Bruny Island ferry to be rather messy and smelly by the time we drove off. Giant squid have a natural ammonia smell and a lot of liquid. As the Productions crew did not want to start filming until 6pm (best light for them), Kathryn and Debby hauled the still partly frozen squid around in the sea in a tarpaulin during the afternoon to help thaw it out, while Paul and Mike built the high scaffold tower. It must be confessed that Squidly (the name evolved) looked totally authentic by the time she was set up on the turning tide with some strategic kelp, just as if she had washed up there. We knew Squidly was a female because two clumps of thread-like sperm packages had been impregnated into her skin, one in an arm and the other in the mantle fold. These were filmed by the crew, but we used the other squid’s head for close ups of the beak and eyes. Squidly is one of only two mated females known by the TMAG to be caught in Tasmanian waters. It was about 30°C most of the afternoon, with a stormy atmospheric sky and a spectacular sunset. The actual filming went perfectly, with the wild, deserted beach and magnificent coastal scenery as backdrop. Moving a 255kg squid around is very hard work, but a specially-made sling with handles helped the six or more people needed to move her — amid clouds of blowflies. The [Productions] team invited us to their rented house later that evening for celebrations, and at midnight we wound our way happily back to the miniature log cabin a colleague had lent us for the night. We sat round the campfire until early morning, physically fending off voracious possums (one mistook Debby’s big toe for something tasty and drew blood, while another tried to take off with my shoe, except my foot was still in it). The two squid were then taken to the TMAG Wet Store and preserved. Leatherwood Online would like to thank the Tasmanian Museum and Art Gallery for their cooperation and research for this series of articles, with particular thanks to Liz Turner, Curator of Invertebrate Zoology.